Urban agriculture is making an increasing contribution to food security in large cities around the world. The potential contribution of biodiversity to ecological intensification in urban agricultural systems has not been investigated. We present monitoring data collected from rice fields in 34 community farms in mega-urban Shanghai, China, from 2001 to 2015, and show that the presence of a border crop of soybeans and neighboring crops (maize, eggplant and Chinese cabbage), both without weed control, increased invertebrate predator abundance, decreased the abundance of pests and dependence on insecticides, and increased grain yield and economic profits. Two 2 year randomized experiments with the low and high diversity practices in the same locations confirmed these results. Our study shows that diversifying farming practices can make an important contribution to ecological intensification and the sustainable use of associated ecosystem services in an urban ecosystem. Over the last century, global biodiversity loss and species extinction have occurred at an unprecedented rate (Barlow et al., 2016), and agricultural intensiﬁcation has been one of the major drivers (Tscharntke et al., 2005; Gonthier et al., 2014). One of the features of agricultural intensiﬁcation is the striking change in land use, in which complex natural ecosystems have been converted to monocultural crop production ecosystems (Tscharntke et al., 2005). This agricultural intensiﬁcation has multiple consequences for ecosystems, including a decline in natural biocontrol services (Symondson et al., 2002), disruption of crop pollination (Kremen et al., 2012; Kovács-Hostyánszki et al., 2017) and extensive damage to naturally-occurring species and the environment from the heavy use of agrochemicals (Tscharntke et al., 2005; Gill et al., 2012; Stehle and Schulz, 2015). Ecological intensification is a new paradigm for agriculture (Gaba et al., 2014; Simons and Weisser, 2017), based on intensifying ecological processes in cultivated areas (Caron et al., 2014; Bowles et al., 2017) to replace synthetic, non-renewable and often toxic anthropogenic inputs with biologically- and environmentally-friendly ecosystem services (Tscharntke et al., 2005; Geertsema et al., 2016). The goals are to achieve more sustainable crop production (Bommarco et al., 2013), increase food security, and improve the quality of agricultural products (Martin-Guay et al., 2018). Biologically-diversified farming can contribute to ecological intensification of agriculture by providing multiple ecosystem services, such as the promotion of biocontrol services (e.g., a decrease in pest abundance and an increase in the abundance of natural enemies of pests) (Harvey et al., 2014; Gurr et al., 2016), a reduction in negative environmental impacts (Tscharntke et al., 2005; Tittonell, 2014; Zhao et al., 2016; Barot et al., 2017), and an increase in crop yields (Cassman, 1999; Tittonell and Giller, 2013; Wittwer et al., 2017). Most previous studies on biodiversity and ecological intensification have focused on smallholder farms (Tittonell and Giller, 2013; Zimmerer, 2013; Zimmerer et al., 2015), while urban agriculture has received little attention. Starting in the 1950s, urban agriculture, defined as the production of crop and livestock goods within cities and towns, has played an increasing role in ensuring food security for growing urban populations (Zezza and Tasciotti, 2010). Urban agricultural systems have many forms, such as community farms, allotment gardens, rooftop gardens, and edible landscaping (Lin et al., 2015). Confronted with population growth and a shortage of land and natural resources in urban ecosystems, urban agriculture has depended heavily on intensive use of pesticides and fertilizers (Altieri et al., 1999). It has been hypothesized that increased biodiversity in urban agricultural systems has the potential to provide important ecosystem services such as pollination, pest control, and climate resilience, thus reducing the need for chemical inputs (Lin et al., 2015). Replicated, multi-site and long-term studies evaluating the effects of plant-diversified farming on ecosystem services have been lacking. To reduce urban poverty, enhance food security, improve environmental management and stimulate participatory city governance, the Resource Centre on Urban Agriculture and Food Security (RUAF Foundation) has established pilot demonstration cities for modern urban agriculture worldwide. One of these cities is Shanghai, China. Shanghai has a 30 year history as a pioneer in urban agriculture, which has played an important role in the urban economy, social stability and public security (Kiminami et al., 2006). This mega-urban municipality includes nine suburbs with agriculture, covering an estimated area of 93,333 hectares of rice, accounting for 14.7% of the total land area in Shanghai. Although agriculture contributes only 0.33% of the city’s Gross Domestic Product and increases in productivity have been slower than in other economic sectors, the city authorities have been paying considerable attention to agricultural production to ensure a stable food supply for the huge urban population. In addition, the annual profit from agricultural sightseeing and tourism in Shanghai is 2.4 billion RMB, further increasing the value of the city’s agriculture. Community farms account for 80% of the total agricultural land in Shanghai. Despite strict laws and regulations, these farms have been experiencing increased intensiﬁcation and mechanization, resulting in biodiversity loss, food safety problems and land degradation. Although there is evidence that diversifying farming promotes ecological intensification in smallholder agricultural systems (Gurr et al., 2016; Rolando et al., 2017), the ecological and agronomic consequences of increased crop diversity have not been studied in depth in urban agricultural environments. The effects of biodiversity on ecosystem services could be different in an urban setting, because urban farms are not surrounded by other farms or semi-natural vegetation, which can provide organisms that deliver ecosystem services. We hypothesize that diversifying farming in an urban setting will host more insect predators, reducing the densities of herbivorous insects, and allowing reduced input of insecticides without considerable yield loss. To test our hypothesis, we analyzed monitoring data collected from 34 community farms in nine districts in suburbs of Shanghai, and we conducted two controlled experiments for further verification. In the early 1990s, Shanghai Agricultural Technology Extension and Service Center (SATESC) established 28 community farms in 8 districts of Shanghai to monitor pest occurrence in rice fields. With the help of Chongming Agricultural Technology Extension and Service Center (CATESC), another six community farms in Chongming district were established for monitoring pest occurrence in rice fields (Figure 1; Figure 1—source data 1). Through our own investigation, we found that the six community farms in Chongming district all included diversified plants, and the 28 community farms in the other 8 districts of Shanghai consisted of rice monocultures. The farmers of the six community farms in Chongming district planted soybeans as a border crop around the periphery of each rice field and common vegetable crops (maize, eggplant, Chinese cabbage, etc.) around the whole rice-growing area. Twenty-eight mono-rice (red dots) and six plant-diversified community farms (green dots) monitored in Shanghai, China. The abundances of the three main rice pests, which have resulted in major crop losses since the late 1990 s, were monitored. The abundance of pink rice borer (Sesamia inferens) and rice brown planthopper (Nilaparvata lugens) in rice fields were evaluated with trapping lamps, and abundance of rice leaf roller (Cnaphalocrocis medinalis) was estimated with field surveys. We also estimated the densities of the main predators of these pests in the rice fields and in the border and neighboring crops of the diversified farms, monitored pesticide use and grain yield, and conducted a continuous economic cost–benefit analysis on both farm types. Complete monitoring data for rice pests, pesticide use and grain yield on these farms started in 2001, and monitoring of predators began at the beginning of 2007. 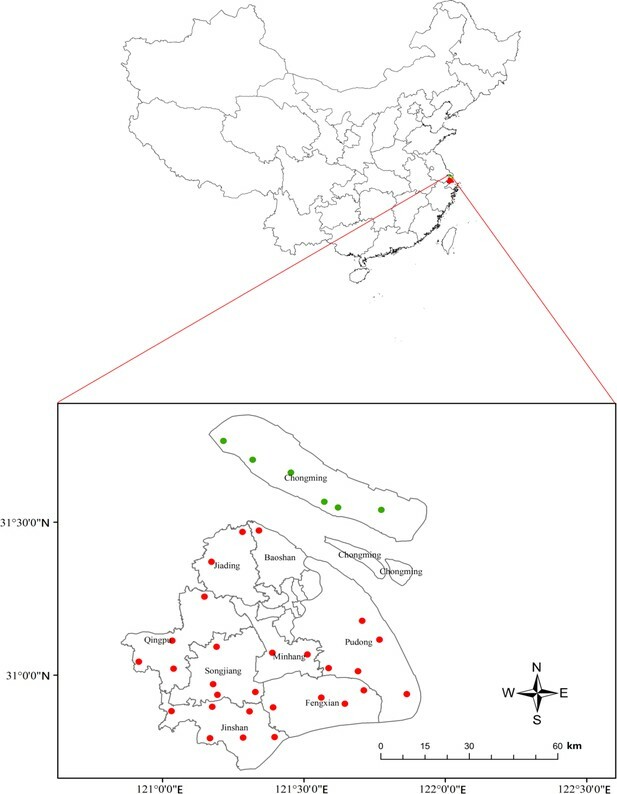 Since the diverse and mono-rice farms were located in different areas of the city, group members from the Shanghai Academy of Agricultural Sciences supplemented the monitoring data with two controlled experiments, in which both treatments were performed at two locations over two years in a complete random design. For all three pest groups, there were no significant interactions between farm type and year (pink rice borer: LR [Likelihood Ratio]=18.617, p=0.338; rice plant-hopper: LR = 12.772, p=0.684; leaf roller: LR = 7.600, p=0.952). Therefore, we analyzed the effects of plant-diversified versus mono-rice farms with main-effects models with only farm type and year as predictors. The main-effects models showed that the abundances of pink rice borer, rice plant-hopper and leaf roller were significantly lower on plant-diversified farms (pink rice borer: LR = 13.864, p=0.002; rice plant-hopper: LR = 10.361, p=0.004; leaf roller: LR = 12.827, p=0.001). 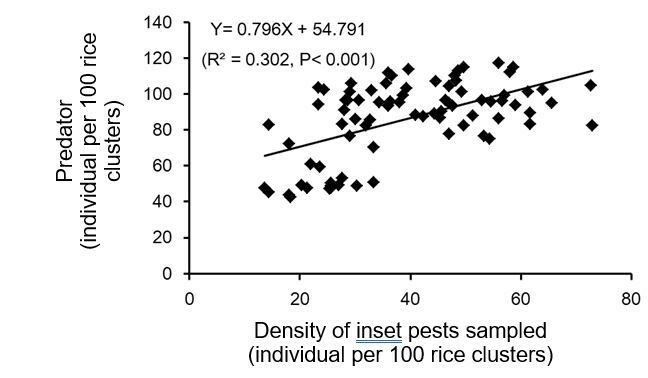 The percent decrease in mean pest abundance on the plant-diversified farms varied from year to year over the 15 year study period (pink rice borer: mean percent decrease = 28.8, SD [standard deviation]=9.9, range = 16.3–47.0, IQR [interquartile range]=20.8–34.5; rice brown plant-hopper: mean percent decrease = 32.3, SD = 17.2, range = 16.8–85.5, IQR = 24.2–30.4; rice leaf rollers: mean percent decrease = 20.0, SD = 6.7, range = 9.0–33.8, IQR = 15.6–24.0) (Figure 2; Figure 2—source datas 1–3). Population dynamics of pink rice borer and brown planthopper trapped in the lamp and rice leaf roller observed in rice fields on plant-diversified and mono-rice farms from 2001 to 2015. (A) and (B) Pink rice borer; (C) and (D) Rice brown planthopper; (E) and (F) Rice leaf roller. The blue and red lines (in Figure 6A, C and E) indicate the plant-diversified and mono-rice farms, respectively. Vertical bars on each point denote SE. From 2001 to 2015, the number of trapped pink rice borers and rice brown planthoppers, and the population densities of rice leaf rollers were monitored from 10 April to 30 September, 11 May to 30 September, and 11 June to 20 September, respectively. For predator abundance (ladybird beetles, lacewings and spiders), there was no significant interaction between farm type and year (LR = 6.150, p=0.740). 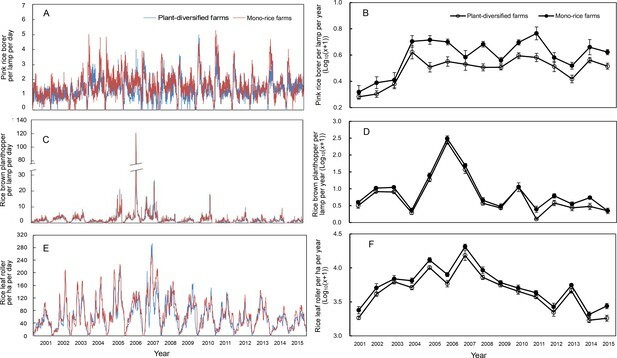 The main-effects model (with farm type and year as predictors) showed that plant-diversified farms had significantly higher predator abundance than mono-rice farms throughout 2007–2015 (LR = 37.002, p=0.001). From 2007 to 2015, annual average abundance of pests' predators observed during all the four stages of rice development was 22.6% (±3.0% [SE]; range 8.3–32.0%) higher on plant-diversified than on mono-rice farms (Figure 3; Figure 3—source data 1). Abundance of predators observed on plant-diversified and mono-rice farms for each year. Abundance of predators in the rice fields was sampled at an interval of 15–20 days (with minor variation due to weather conditions) from seedling stage to grain stage from 2007 to 2015. Vertical bars on each point denote SE. From 2007 to 2014, abundances of these predators in the soybean border crop ranged from 69.4 (±11.6) to 127.4 (±19.9) individuals per 100 plants, and in the neighboring crops it ranged from 121.0 (±27.6) to 153.6 (±26.6) individuals per 100 plants in maize, 101.3 (±21.3) to 117.3 (±22.5) individuals per 100 plants in eggplant, and 39.4 (±6.2) to 46.0 (±5.2) individuals per 100 plants in Chinese cabbage (Figure 4A). Annual average abundances of predators in soybean, maize, eggplant and Chinese cabbage were 92.4 (±7.1), 141.9 (±5.7), 107.3 (±2.9) and 43.1 (±1.3) individuals per 100 plants, respectively (Figure 4B). 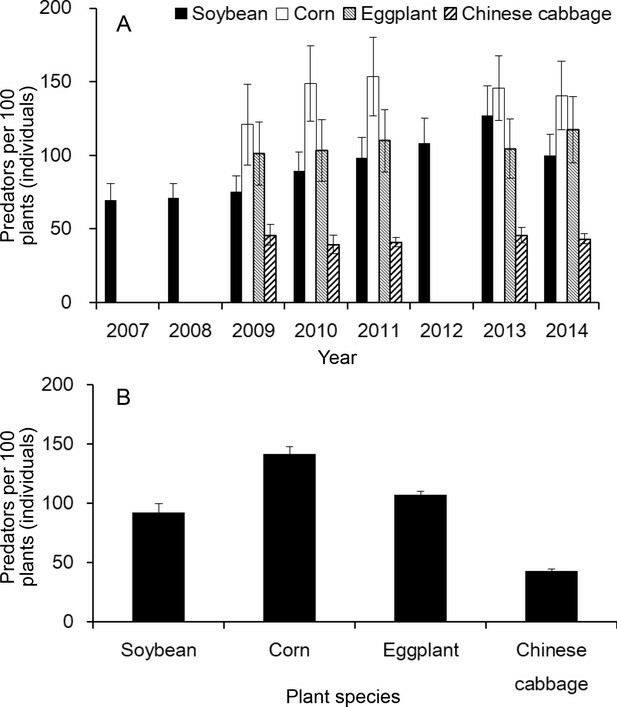 Predator abundance on the border crop of soybeans and neighboring crops (maize, eggplant and Chinese cabbage) on plant-diversified farms. (A) Predator abundance in different years; and (B) Predator abundance on four crops (soybean, maize, eggplant and Chinese cabbage). Abundance of predators (ladybird beetles, lacewings and spiders) were monitored in soybeans from 2007 to 2014 and in neighboring crops (maize, eggplant and Chinese cabbage) during 2009–2011 and 2013–2014. Vertical bars on each point denote SE. There were significant interactions between farm type and year for the number and amount of insecticide sprays (number: LR = 56.395, p=0.001, amount of commercial insecticide: LR = 96.67, p=0.001; amount of active ingredient insecticide: LR = 307.33, p<0.001), so interactions were included in the statistical models. In the first two years (2001 and 2002), the number of insecticide sprays and the amount of insecticide sprays did not decrease on the plant-diversified farms, but in the following 13 years (2003–2015), there were significant decreases (number of insecticide sprays: mean percent decrease = 16.8, SD = 4.9, range = 11.8–26.2, IQR = 13.0–18.9; amount of commercial insecticide sprays: mean percent decrease = 18.5, SD = 4.1, range = 10.1–25.4, IQR = 17.3–21.2; amount of active ingredient insecticide sprays: mean percent decrease = 27.1, SD = 17.2, range = 5.0–66.2, IQR = 18.2–27.3) (Figure 5A–B; Figure 5—source datas 1–2). Dynamics of the number of insecticide sprays, the amount of insecticide sprayed and grain yield per crop on plant-diversified and mono-rice farms from 2001 to 2015. (A) Number of insecticide sprays; (B) Amount of commercial insecticide sprayed (kg•ha−1); (C) Amount of active ingredient in insecticide sprayed (kg•ha−1); and (D) Grain yield (t•ha−1). Vertical bars on each point denote SE. 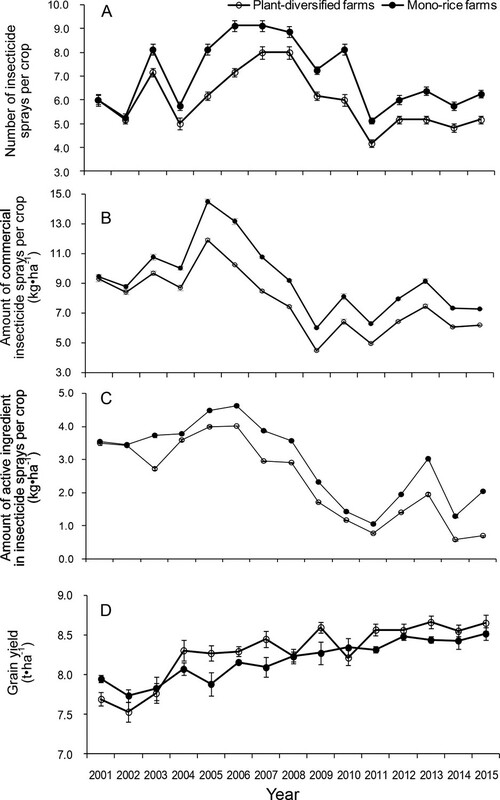 Monitoring data for each year showed that plant-diversified farming generally had higher grain yield (Figure 5C). The farm type × year interaction effect for grain yield was marginally significant (LR = 27.214, p=0.058). According to the main-effects model with only farm type and year as predictors, the farm type effect was not significant (LR = 0.0005, p=0.991). The economic cost–benefit analysis showed that the plant-diversified farming generated a net advantage of 576 (±116) RMB per hectare per year, which was 3.48% (±0.79%) higher than the mono-rice farms (Figure 5—source datas 3–4). For the abundances of the three pest groups and the predators in the common-location experiments, the statistical models indicated that plant-diversified fields had significantly lower abundance of stem borer (LR = 7.343, p=0.043), and marginally significant lower abundance of rice plant-hopper and leaf roller (rice plant-hopper: LR = 6.946, p=0.066; leaf roller: LR = 5.792, p=0.084). The increase in predator abundance was also marginally significant (LR = 7.545, p=0.069). Averaged over both experiments, the numbers of the three pest groups all decreased during the four years (stem borer: mean percent decrease = 15.6, SD = 2.9, range = 12.4–18.8, IQR = 13.6–17.5; rice plant-hopper: mean percent decrease = 16.7, SD = 1.6, range = 15.2–18.8, IQR = 15.5–17.5; leaf roller: mean percent decrease = 16.0, SD = 3.2, range = 12.3–18.7, IQR = 13.9–18.5) (Figure 6A–C), and the abundances of their predators increased on the plant-diversified fields (mean percent increase = 12.7, SD = 2.6, range = 8.8–14.8, IQR = 12.2–14.0) (Figure 6D). Effects of plant diversification in experiment in which plant-diversified with mono-rice farming were compared at the same locations. (A) Density of rice plant-hoppers sampled in rice field plots; (B) Density of rice stem borers sampled in rice field plots; (C) Density of rice leaf rollers sampled in rice field plots; (D) Density of the predators (ladybird beetles, lacewings and spiders) sampled in rice field plots; (E) Amount of insecticide sprays per rice field plot (kg•ha−1); and (F) Grain yield per rice field (t•ha−1). Vertical bars denote SE. Significantly less insecticide was applied on the plant-diversified fields in the common-location experiments (LR = 7.818, p=0.048), and these had marginally significantly higher grain yield (LR = 6.691, p=0.054). Insecticides were applied at rate of 5.25 (±0.20)–7.16 (±0.15) kg•ha−1 on the plant-diversified rice fields, which was, on average, 14.21% lower than the controls over the four years (SD = 4.07, range = 9.38–18.90, IQR = 11.94–16.65) (Figure 6E). Plant-diversified rice fields produced grain yields of 8.47 (±0.07)–8.73 (±0.05) t•ha−1, which was on average 2.26% higher than the controls (SD = 0.28, range = 1.88–2.53, IQR = 2.13–2.45) (Figure 6F). The power analyses suggested that by repeating the common-location experiment at an additional experimental site, the statistical power for achieving significant farm type effect on the abundances of rice plant-hopper, leaf roller, and predator could reach over 80%. For grain yield, 80% power for detecting significant farm type effect could be achieved with two additional experimental sites. Adding years and replicates could also increase power, but not as effectively as increasing the number of sites; 80% power could not be reached even by large additions of years or replicates (Figures 7–10). Power analysis results for rice plant-hopper occurrence, where the power are estimated for additional experimental sites (left), additional replicates for each farm type–site–year block (middle), and additional years (right), based on the effect size estimated by the mixed-effect model fitted to the common-location experiment data. The horizontal line marks the standard power level of 80%. Vertical line denotes the 95% confidence interval for the power estimates. Power analysis results for rice leaf roller occurrence. See caption of Figure 7—figure supplement 1 for details. Power analysis results for predator abundance. Power analysis results for grain yield. The abundances of the three predator groups (ladybird beetles, lacewings and spiders) were much higher in the maize neighbor crop (120.1 [±10.3]–146.3 [±4.3]) individuals per 100 plants) than in the soybean border crop (69.2 [±3.2]–93.1 [±7.4]) individuals per 100 plants) (Figure 6—figure supplement 1; Figure 6—source datas 1–6). The initial establishment of monitoring sites of the community farms was initiated by farmers without knowledge of statistical design, so the establishment of 34 community farms was done without appropriate randomization in the 15 year study. While non-random distribution of the two farming types might have affected the results, it is unlikely that this could account for the main results. All 34 farms belong to Shanghai suburbs and have similar weather conditions and soil types. Because of the lack of randomization in the monitoring study, we performed the two common-location experiments, which verified the results of the monitoring study. Both the monitoring data on community farms and the results of the common-location experiments clearly indicated that increased predator abundance was concomitant with reduced pest abundance, resulting in reduced insecticide application on plant-diversified fields. In all likelihood, the reduced pest abundance contributed to rice growth, development and reproduction, and thus increased rice yield. These results were consistent across years in the monitoring study and in the common-location experiments. The reduction in insecticide application and decreased labor cost of spraying insecticides, together with the slightly higher grain yield on the plant-diversified farms, resulted in an increased economic benefit. The increased abundance of predators in more diverse fields likely occurred because the higher diversity of plants provided ‘resource pools’ for the predators. The additional plants provided food sources (nectar, pollen, honey dew, etc. ), as well as breeding habitats and refuges for these predators, allowing them to increase their longevity and fecundity (Mason et al., 2014; Wan et al., 2016a; Woodcock and Heard, 2011). A previous study indicated that these predators can disperse up to 40 meters, and can therefore move into rice fields from adjacent habitats and crops (Yu et al., 2002). Thus, the most likely explanation is that the increase in the abundance of invertebrate predators spread from border and neighboring crop areas onto the rice fields, increasing predation on pest populations. A similar effect due to neighboring crops was observed in Bt cotton fields (Lu et al., 2012). Diverse crops and weeds may also provide similar advantages for parasitoids, which have been shown to exhibit improved biocontrol services, reducing pests feeding on plant tissues and plant products, such as pollen, nectar, and sap (Gurr et al., 2016; Wäckers et al., 2007). Ecosystem service providers and service-providing units are concepts that have been used to study ecological intensification (Gurr et al., 2016; Luck et al., 2009). In our study, diverse plants surrounding rice fields can be considered ecosystem service-providing organisms, supporting predators that reduced the populations of pest herbivores. The diverse plant communities initiated a trophic cascade in rice-herbivore-predator interactions, in which increased abundance of predators reduced their herbivores, which in turn resulted in a positive effect on the primary productivity and rice yields, permitting changes in management: a reduction of insecticide inputs and labor. These changes resulted in a small but immediate increase in economic performance (Figure 11). The benefits of plant-diversified farming have not previously been assessed on such a long-term basis. Some studies have reported that plant-diversified farming resulted in lower yields and higher pest densities, leading to criticism of the approach by some scientists and rejection by some farmers (Dassou and Tixier, 2016; Letourneau et al., 2011). Maintaining high crop yields is important if ecological intensification is to be widely accepted (Cassman, 1999; Geertsema et al., 2016; Pywell et al., 2015; Zimmerer, 2013). In our study, we actually observed a slight increase in crop yield and economic performance, while the pesticide use was reduced, enhancing agricultural sustainability. A path diagram depicting the hypothesis on the relationships among the variables considered in this study. ‘+' indicates increased level and '-' indicates decreased level. Organic agriculture has the potential to promote ecological intensification (Crowder et al., 2010; Winqvist et al., 2012), but its adoption has been limited, in large part because organic farming usually produces lower short-term yields (Seufert et al., 2012), although this can be compensated for by higher prices for the products in some markets. Conventional farming has been based on crop monocultures and large inputs of mineral fertilizers and pesticides, making it difficult to provide farmers with feasible strategies for incorporating ecological intensification. Biological diversification can be a first step in promoting ecological intensification of conventional agriculture (Gurr et al., 2016), as it often shows an immediate positive effect through the provisioning of ecosystem services (Bommarco et al., 2013), as demonstrated in our study. Unlike smallholder farmers, urban farmers tend to be better educated and have a broader vision of farming. They have more contact with and obtain more information from policy makers and scientists, and are therefore more open to new ideas. Thus, ecological intensiﬁcation of agriculture can be more easily implemented in urban than rural agriculture in China. Support from the government, including new laws and regulations, can facilitate ecological intensification. It is encouraging that 93.8% of urban farmers would like to adopt plant-diversified farming to promote ecological intensification, according to a questionnaire survey (Wan et al., 2016b). There is reason to expect that plant-diversified farming will be practiced extensively in urban agriculture in the near future. One major challenge is the ongoing conversion of agricultural land, sometimes very high quality agricultural land, to housing, industry and commercial use throughout the world (Singh and Swami, 2015). Our results on pests and pesticide application resulting from the introduction of border and neighboring crops, without a highly-developed theory or a vast amount of quantitative data on the relationship between plant diversity and ecosystem services, suggest that the potential for ecological intensification through increased plant diversity is much greater than what we have shown here. A major research effort in ecological intensification could result in revolutionary changes in agriculture, in which pesticide application can be reduced drastically or even eliminated, improving food safety and environmental quality off as well as on farms. Urban agriculture can serve a laboratory for such research, while providing an important source of food for city dwellers. We urge researchers to focus on forms of biotechnology that can contribute to ecological intensification, which has a great potential to conserve and promote biodiversity, while contributing to the provision of food to a growing human population (Pywell et al., 2015; Zhao et al., 2016; Weiner, 2017), rather than on forms of biotechnology that increase unsustainable intensification. In this study, all community farms are located in nine districts in the suburban areas of Shanghai, China, belonging to alluvial plains of the Yangtze River Delta (Figure 1). All sites are in the same geographic and climatic region (East Asian monsoon zone, with four distinctive seasons). Southeast winds prevail in summer, producing hot, rainy weather, while southerly winds dominate in winter, causing winter monsoons. In early 1990s, SATESC established 28 community farms (120°54’–121°51’E, 30°47’–31°28’N) in eight districts (Minhang, Jiading, Baoshan, Pudong, Fengxian, Songjiang, Qingpu and Jinshan districts) to monitor pest occurrence in rice fields. As these 28 community farms were planted with the sole crop (rice), we consider them as the control farms. After repeated requests by the Chongming Agricultural Technology Extension and Service Center (CATESC), SATESC established another six community farms (121°12’–121°46’E, 31°32’–31°49’N) in Chongming district for monitoring pest occurrence in rice fields in late 1990 s. One to six monitoring farms with fixed staff were established in each district of Shanghai in late 1990s (Figure 1; Figure 1—source data 1). In Chongming district, the six community farms were labor intensive, and the farmers grew a border crop of soybeans around the periphery each rice field and common vegetable crops (maize, eggplant, Chinese cabbage, etc.) around the whole rice-growing area. Thus, we considered the six community farms as the treatment farms. Each monitoring farm in the control and treatment had an area of 1.3–2.0 hectares. We collected the data from the 34 community farms from 2001 to 2015. The farmers within each community farm applied pesticides according to pest forecast information offered by the Plant Protection Station affiliated to the Agricultural Technology Extension and Service Center in each district from which we obtained information on the pesticide application from 2001 to 2015. The application of insecticides (time, type, amount, target crop, etc.) followed the ‘Pest Control Guidance’ issued by SATESC, so that insecticides used were the same on the treatment and control farms each year (Figure 1—source data 2). The managers of each farm were directed to apply insecticides only when pest abundance reached the Economic Injury Level, which is the basis for decision-making in integrated pest management (IPM) programs (Higley and Pedigo, 1993). Thus, the number of insecticide sprays and the amount of insecticide sprayed each year varied among the 34 community farms, because the abundance of pests varied among the farms. We obtained the pest information for mono-rice and plant-diversified farms from the eight districts and from the six farms in Chongming district, respectively. The farmers in the 34 community farms uploaded their pest information through the server into the Shanghai Pest Monitoring System, which was accessible to the monitoring locations, 9 districts of Agricultural Technology Extension and Service Centers and SATESC. 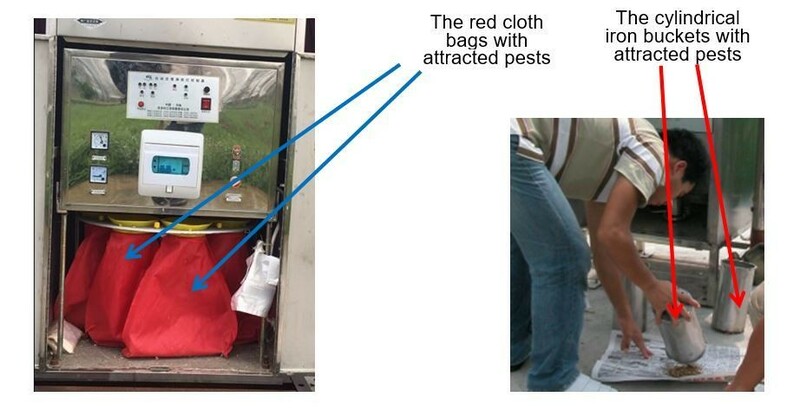 Occasionally, a few farmers on the 28 mono-rice farms in eight districts (Minhang, Jiading, Baoshan, Pudong, Fengxian, Songjiang, Qingpu and Jinshan districts), did not upload monitoring data for pests, so these data were not in the system when the SATESC released the pest information for each district. On each farm, the rice growing area was divided into nine paddy plots, which were 60–70m × 25–35 m on each plot. There were 0.3–0.5 m wide earth banks around each paddy to retain water for the rice crop. On the control farms, these ridges were left bare. On the plant-diversified farms, a border crop of soybeans was hand-sown with hill-seeding on the bunds. Neighboring crops (maize, eggplant, Chinese cabbage, etc.) were intersown in an approximately 6–10 m wide area around the periphery of the whole area. Pesticides were not applied to the soybean borders or the neighboring crops on plant-diversified farms, nor was there any form of weed control in the soybean or neighboring crop areas. All the community farmers applied herbicides within the rice fields in both the mono-rice and plant-diversified farms. On all community farms, the hybridized rice varieties were cultivated and agronomic practices were basically the same each year. At the end of the growing season, in a way that was consistent across all farms, the SATESC asked the technical staff of the 9 districts of Agricultural Technology Extension and Service Centers to measure the grain yield at all locations. Three to six rice field plots of 0.120–0.167 hectares were selected in each community farm to measure the grain yield each year. The fully mature rice plants were cut and threshed (‘Z’-style sampling with 10, one square meter subplots in each plot) (Figure 12), and the grain yield per unit area determined. The layout of each rice plots in each community farm and ‘Z’-style grain yield sampling. On each farm, the rice growing area was divided into nine paddy plots, which were 60–70 × 25–35 m on each plot. Three to six rice field plots of 0.120–0.167 hectares were selected in each community farm to measure the grain yield each year. The rice plants at harvest stage (‘Z’-style sampling with 10, one square meter subplots in each plot) were mowed and threshed, and the grain yield per unit area was obtained. ‘×' and black solid dots denoted rice, and 1 m2 sampling areas for rice grain yield, respectively. The interval between two adjacent black solid dots was about five meters. Insect trapping lamps (Jiaduo Company Limited, Henan Province, China) were installed on the periphery of 9 paddy plots of each community farm to estimate the abundance of the main herbivore pests (pink rice borer, rice brown planthopper, etc.). Lamps attracted the pests, which fell into cloth bags or cylindrical iron buckets below the lamp, and then the workers on each farm identified the species and counted the pests every day. Each lamp tube was hung 1.5 m above the ground and was automatically turned on at 6:00 p.m. and turned off at 5:00 a.m. from early April to late October (Wan et al., 2016a). From 2001 to 2015, we monitored the number of trapped pink rice borers and rice brown planthoppers from 10 April to 30 September and from 11 May to 30 September, respectively, as this was when they occurred in the rice fields. During the emergence period of rice leaf rollers, a count of adult moths was taken from a sample plot of 66.7 × 10−3 hectares around the lamp. A two-meter long bamboo pole was used to slowly shake the top half of rice plants, working upward, and the total number of flying moths observed in the sampling plot was considered an estimate of the density of adult rice leaf rollers (Wan et al., 2015). From 2001 to 2015, the population densities of rice leaf rollers were sampled from 11 June to 20 September. Monitoring is very labor intensive, so the abundance of the three major generalist predator groups (ladybird beetles, lacewings and spiders) could only be monitored on some of the community farms. Three to six plant-diversified farms and 6–10 mono-rice farms were selected to monitor the predators from 2007 to 2015 (Figure 1—source data 1). ‘Z’ style scouting using five subplots consisting of 20 adjacent clusters of rice plants was performed from the seedling to harvesting stage in the treatment and control farms, giving 100 clusters of rice plants. Each sampling was performed every 15–20 days (with some variation due to weather conditions) from 2007 to 2015. Over the whole rice growing period, there were nine sampling dates each year: two in the seedling, tillering and grain stages and three during the booting stage. The population dynamics of the three major generalist predator groups (ladybird beetles, lacewings and spiders) was evaluated approximately every 15 days from middle/late June to early October in the border crop of soybeans on 4–6 plant-diversified farms from 2007 to 2014, and in the three main neighboring crops (maize, eggplant and Chinese cabbage) in 2009–2011 and 2013–2014, giving seven sampling dates each year for the predators in border and neighboring crops. At each sampling date, a subplot of 20 adjacent plants at five randomly selected locations were visually investigated and all predators counted and recorded (Lu et al., 2012). Because the mono-rice and diversified farms in the 15 year study were located in different suburban areas of Shanghai, we also performed two more highly controlled 2 year experiments in which both treatments were performed at the same locations. One experiment was conducted in Xinchang Town, Pudong district (121°38’E, 31°01’N), in 2009 and 2010 and the other in Sanxing Town, Chongming district, (121°17’E, 31°44’N) in 2013 and 2014. For each site, the experiment was a randomized block design with three replicate blocks. Each block contained two plots — one for plant-diversified farming and the other for mono-rice farming (50–55 × 30–35 m plot size in Xinchang, and 55–60 × 35–40 m in Sanxing) (Figure 13). In early-to-middle May of each year, a border crop (soybean) was planted on the earth banks around the plots of the diversified cropping treatments. In the periphery of each rice field plot of the diversified cropping treatments, a neighboring crop (maize) was interplanted in early June on the 1.5–2.0 m-wide bare soil border around soybeans. Blocks were spaced more than 100 m apart, and adjacent plots in each block were separated by a > 50 m wide buffer zone consisting of a rice field that was managed according to normal pest management, which was identical in all control treatments. The layout of plant-diversified fields in which a border crop (soybean) was interplanted around the rice fields and a neighboring crop (maize) was interplanted around the soybeans. (A) Drawing plot diagram for plant-diversified fields; and (B) the photograph for plant-diversified fields. ‘×', ‘o’ and ‘§' denoted rice, soybean and maize, respectively. The layout of each control rice field was similar, but without soybeans or maize. Hybridized rice variety ‘Huayou 14’ (bred by Shanghai Academy of Agricultural Sciences) was transplanted in the middle-to-late June each year, and agronomic practices such as soybean planting, weed management, pesticide use, irrigation, etc., were the same as on the monitoring sites. Three hundred kg nitrogen per hectare was used in each rice field plot, with 70% of this applied at the basal-tillering fertilizer and 30% at the panicle stage. Workers sprayed the rice crop with pesticides over the course of the growing season as deemed necessary according to the ‘Pest Control Guidance’ issued by SATESC. The number of insecticide sprays and the amount of insecticide sprayed were based on the pest abundance in all experimental blocks. As in the monitoring study, the workers in each block were directed to withhold insecticide applications unless pest abundance reached the Economic Injury Level issued by SATESC. To ensure the continuity and reliability of the information, we kept written record of the insecticide input details for each plot. The pests and predators in each plot of rice fields were scouted and sampled at 10–15 day intervals from the seedling to the harvesting stage (ten sampling dates each year), using methods similar to those described above, except, instead of using a trapping lamp, a white stainless 0.4 × 0.3 m steel plate was placed at the base of rice plants (Cheng, 2001). Immediately thereafter the rice plants were slapped with hands so that pests and predators (including lacewing larvae) fell into the plate. The numbers of pests and predators on the plate were then counted. To further survey the abundance of stem borers and leaf rollers in each plot, we examined infested rice stems and leaves at each sampling point and counted the stem borers and leaf rollers present. The abundance of rice stem borers or leaf rollers at each sampling location was the sum from the plate and from the infested stems or leaves. The abundance of the three major generalist predator groups (ladybird beetles, lacewings and spiders) was surveyed about every 10 days in the border crop of soybean and in the neighboring crop of maize from middle-to-late June to late September in 2009 and 2010 in Xinchang, and in 2013 and 2014 in Sanxing, with ten sampling dates each year for the predators in soybean and maize plants in each plot in the plant-diversified field block. At each sampling date, 100 plants from five randomly-selected subplots of 20 adjacent plants were visually investigated and all predators were counted and recorded. The monitoring studies involved 34 farms belonging to 9 districts of Shanghai, and each farm had longitudinal repeated measurements across the 15 year study period. Due to the longitudinal nature of the data, we used mixed-effects models, a widely adopted method for analyzing data with repeated measurements (Bolker et al., 2009), to analyze the effects of the community farm types (plant-diversified vs. mono-rice farms) on the following eight response variables: numbers of pink rice borers and rice brown plant-hoppers trapped in the lamp, the population density of rice leaf roller observed in rice fields, the abundance of predators observed in the rice fields, the number of insecticide sprays, the amount of commercial and active ingredient insecticide sprayed, and grain yield. 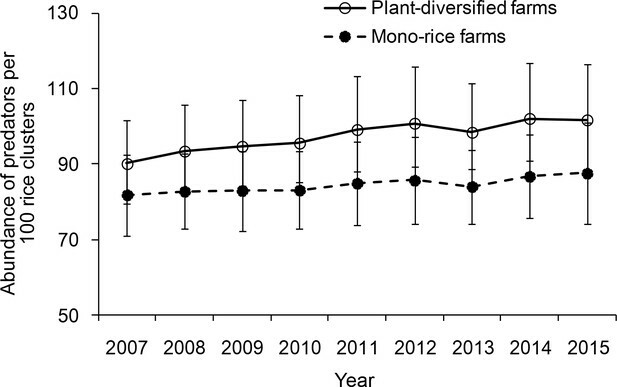 For predator abundance in the rice fields, the data used for analysis involved measurements from 6 to 10 mono-rice farms and 3–6 diversified-farms collected from 2007 to 2015. For the other seven outcome variables from 2001 to 2015, measurements for plant-diversified farming practices were obtained from the six community farms within Chongming district, and measurements from the 28 mono-rice farms were averaged at the eight district levels except for Chongming district (resulting in eight averaged measurements for mono-rice farming and six measurements for plant-diversified farming, collected annually across the 15 year monitoring period). To account for the correlation among the outcomes at neighboring years within each farm identity, the mixed-effect model incorporates random intercepts and random coefficients for the polynomial year terms to model variation in yearly trends among the farms. Third-degree polynomials were used to model the yearly trends within each farm as the yearly trends were nonlinear for the majority of the responses (Figures 2, 3 and 5). Altogether, year is treated as a categorical variable in the fixed-effect component of the model for adjustment of the overall year effect across all locations, and as a continuous variable in the random component for adjusting the within-farm yearly trends. To determine the significance of farm type, linear mixed effect models with fixed-effects farm type, year, and interaction between farm type and year were first used to test whether the interaction effect was significant using model comparison tests. If the interaction effect was not significant, the interaction term was dropped from the model, and the significance of farm type determined using a model with only farm type and year as fixed-effects. If the interaction term was significant, the farm type effect was analyzed in conjunction with the interaction effect. The numbers of the three pest groups were log10(X + 1) transformed to reduce the influence of a few outlying observations. In the common-location experiments, replicated measurements were obtained from two farms, and each farm had measurements collected over two years. Here we also used a mixed-effects model to analyze the effects of the rice field types (plant-diversified fields and mono-rice fields) on the densities of rice plant-hoppers, stem borers, leaf rollers and predators sampled in rice field plots, the amount of insecticide sprays, and grain yield. In this mixed-effect model, the random-effects component contains varying intercepts, farm type effects, and year effects for the farm identities. The significance of the farm type effect was determined by model comparison tests, where the full model with the farm type factor was compared with the reduced model with the farm type factor removed. Parametric bootstrap tests with 2500 bootstrap samples were used for significance testing (Halekoh and Højsgaard, 2014). The standard significance level 0.05 and a marginal significance level 0.10 were considered. R version 3.3.0 was used for the above analyses. An economic cost–benefit analysis was conducted according to Gurr et al. (2016), in which we considered the insecticide material costs in each treatment, the cost of seeds used to establish border and neighboring crops in the plant-diversified farming treatment. The analysis also reflected a labor cost for spraying insecticides, planting and soybean harvesting. The benefit was focused on the value of grain yield and the soybeans harvested on paddy field ridges. Other material inputs and labor costs were not included, as these were not consistent across treatments. The grain and soybean price per kilogram and the labor force was based on the average price in Shanghai each year. The economic costs of biodiversity loss, environmental pollution and human health caused by the negative effects of pesticides could not be included. For the common-location experiment data analysis, simulation-based power analyses were performed for marginally significant responses to farm type at the standard significance level of 0.05 for the abundances of rice plant-hoppers, leaf rollers and predators and for grain yield. Using the estimated effect size from the fitted mixed-effects model, the statistical power was estimated for number of experimental sites from 2 to 8, number of years from 2 to 8, and number of replicates within each farm type-site-year combination from 3 to 38. Statistical power was estimated based on 200 simulations. The target statistical power was 80%, and the R package ‘SIMR’ (Green and MacLeod, 2016) was used for power analyses. Due to the costs and manpower required, additional replication of the common-location experiments was not possible. Agriculture and Human Values 16:131–140. Agronomy for Sustainable Development 37:13. Trends in Ecology & Evolution 28:230–238. Journal of Applied Ecology 54:1785–1793. Current Opinion in Environmental Sustainability 8:44–52. Journal of Asia-Pacific Entomology 4:209–215. Frontiers in Ecology and Evolution 2:29. Frontiers in Ecology and the Environment 14:209–216. Proceedings of the Royal Society B: Biological Sciences 281:20141358. Methods in Ecology and Evolution 7:493–498. Journal of Statistical Software 59:1–32. Agriculture, Ecosystems & Environment 46:233–243. Basic and Applied Ecology 16:189–201. Science of the Total Environment 615:767–772. Proceedings of the Royal Society B: Biological Sciences 282:20151740. Agriculture, Ecosystems & Environment 236:221–233. Nature Ecology & Evolution 1:1136–1145. Journal of Agroecology and Natural Resource Management 2:290–295. Can generalist predators be effective biocontrol agents? Annual Review of Entomology 47:561–594. Current Opinion in Environmental Sustainability 8:53–61. Annual Review of Entomology 52:301–323. Annals of the New York Academy of Sciences 1249:191–203. Journal of Animal Ecology 80:495–503. Agriculture, Ecosystems & Environment 224:123–130. Current Opinion in Environmental Sustainability 14:49–60. Thank you for submitting your work entitled "Plant diversification contributes to ecological intensification of mega-urban agriculture" for consideration by eLife. Your article has been evaluated by a Senior Editor and three reviewers, one of whom, Bernhard Schmid (Reviewer #1), is a member of our Board of Reviewing Editors. As mentioned at the pre-submission stage, we found your study potentially very relevant and interesting for a broad readership because it seems to show that farm-level plant diversity may increase crop protection by encouraging predators of pests such that less chemical pest control will be necessary without yield losses. However, our problems with the full submission are still the same as with the pre-submission, namely that you do not clearly enough explain the lack of randomization in the 15-year study and you continue to use inappropriate, simple statistics. These problems unfortunately were seen by all reviewers, who in addition point out further issues, in part related to the lack of appropriate analysis. In particular, one reviewer mentions the possibility that the causality between reduced insecticide use and increased predator level could go either direction. I hope that with the extensive comments of the reviewers you can further improve your manuscript for submission to another journal. As mentioned at the pre-submission stage, I find this study potentially very relevant and interesting for a broad readership because it shows that farm-level plant diversity may increase crop protection by encouraging predators of pests such that less chemical pest control will be necessary without yield losses. My problems with the full submission remain, namely that the authors do not clearly enough explain the lack of randomization in the 15-year study (was it their choice not to randomize or was it because they met a "natural experiment" that had been started by others with lack of knowledge about statistical design) and use inappropriate, simple statistics. The first problem may be resolved by explaining in more detail who prepared the study and why it was not randomized. The second problem can be easily resolved by requesting the help of someone who knows how to properly analyze data from such experiments as the authors carried out. Here "farm identity within farm type" is a random-effects term and must be included in the model to serve as an error term for "farm type" (which is now tested wrongly against the residual). Similarly, "farm identity x linear year" can be used as error term to test "farm type x linear year" if the authors decide to make this probably useful linear contrast. It seems the authors also used t-tests in which they used the year-averages of y for the two farm types. However, this is not allowed because those are repeated measures of the same set of control and treatment farms. It is like comparing the height of a single tree given nutrients with that of a single control tree, using 15 years of growth data as replicates to test if there are significant effects of nutrients on tree height in more than the two particular tree individuals. Also, several speculative statements in the Discussion could be supported with more sophisticated statistical analysis of the data. In particular, the authors should use the fact that they have evaluated different variables at the same farms to calculate multiple linear regressions or include co-variates in the above models and perhaps integrate these analyses all into a structural equation model, that will allow the authors to explore their hypotheses how the different variables affected each other in a path-analytic diagram. At present these are speculations, even though the authors often present them as facts in the Discussion. Nian-Feng Wan and colleagues studied the impact of diversified rice cropping on pests, their predators and yield (including economic benefit) in 34 community farms in Shanghai, China. They found that rice fields with ridges planted by soybean and guards surrounding the crop area planted by maize, eggplant and Chinese cabbage, i.e. diversified crop fields, showed reduced pest infestation, higher predator abundance, less pesticide use and occasionally even higher yield. Economically, the diversified crop fields where more beneficial than conventional ones. The study is based on an impressive dataset, including over 10 years of data from all the community farms, with high temporal and spatial resolution. Furthermore, due to the non-random distribution of the two farming types in Shanghai, the authors also performed a well-designed experiment to test if the results obtained from the long-term farm observations hold under experimentally controlled conditions. I therefore think that this is a very well conducted and extremely well-written manuscript. I enjoyed reading and I think this could be of interest to a wide audience of researchers and stakeholders, and therefore be potentially of high impact. My main concerns are related to (1) the selection of the farms, (2) the set-up of the diversified farms, and (3) the insecticide use. 1) It is not clear to me how the farms were selected for this study. Some more information on the selection procedure would be highly appreciated. The sampling design is very unbalanced (28 conventional vs. 6 diversified farms) and not well distributed across Shanghai (the 6 diversified farms were all located on Chongming Island whereas none of the 28 conventional farms was located in this suburb). I guess there must be a good reason for this, which would clarify this slightly awkward sampling design. 2) It is unclear to me, how the 6 diversified farms were selected, in particular if these farms were set-up as such through an initiative by those farmers before the observations started or if they were set up specifically for this study through initiative of the researchers. In the latter case, the selection would be highly questionable and could potentially confound most of the results. 3) The results of the insecticide use (in particular the number of sprays) seem awkward, given that farmers "applied pesticides according to pest forecast information offered by the Plant Protection Station". I guess this forecast is the same for all farmers and would therefore suggest the same application regime for all farms. I therefore wonder to what extent the differences in pesticide use are simply caused by the contrasting interests of the different farmer communities. A proper pesticide use study would rather apply similar amounts of pesticide and assess their impact on the pest or reduce the pest to similar amounts and quantify pesticide use. However, in this study it seems that both pesticide use and pest abundance varied among farming types, resulting in difficulties to infer sound conclusions. The study analyses a long-term dataset of functional arthropod groups of herbivores and predators (herbivores: three different species of specialist herbivores on rice crop; predators: three generalist predators groups, namely ladybird beetles, lacewings and spiders), replicated over multiple farms and several years. In addition, they have data on insecticide use and yield. The core idea is to test whether a diversified farming system leads to an increased top-down control compared to a monoculture situation, followed by a reduced insecticide use and increased yield. They analysed a total of 6 diversified farms and compared it to 28 control farms. One farm was approximately 2 ha in size. The diversified farm consisted of 9 rice fields surrounded by a stripe of soybeans and an adjacent stripe of another crop. Accordingly, the monoculture farms had 9 rice fields which were surrounded by bare ground. I agree with the authors that we have a lack of knowledge on factors driving ecological intensification in urban systems. However, I have a couple of major concerns with the study. First, the authors claim that the reduced insecticide use on diversified farms was a consequence of the increased top-down control due to increased predator densities. I wonder how they can rule out that it is not the opposite mechanism, namely that there was a reduced insecticide use on the diversified farms and as a consequence there was an increased predator density which then led to increased top-down control? In other words, how can they rule out that the result they find is not simply a consequence of reduced insecticide use but an effect of having multiple crops on a farm (i.e. diversified farm)? A second major concern is the statistical approach used. First, the data are clearly time-series with nicely oscillating densities indicating lag-effects (Figure 2). In addition to lag-effects, the models should include more variables. For example, for explaining predator densities it would be important to incorporate the prey densities in the model. Second, the model (no matter whether it is a time-series analysis or an ANOVA) needs to incorporate the fact that repeated measures were obtained from the same location. Also, to analyse long-term data with multiple t-tests (for each year one test) is not appropriate. Third, the description of the statistical methods is confusing and incomplete. A third major concern is that the main conclusion of higher predator control is not inferred from an experiment (for example, by exposing a standardized number of prey to predators) but based on a correlation. Finally, the Introduction should be more put into a theoretical context, i.e. why and how do diversified farming systems drive biodiversity and ecosystem functioning. Further, the quality of the literature cited should be improved and all literature cited should be included in the reference list, e.g. Tscharntke et al., 2005. Thank you for resubmitting your work entitled "Plant diversity promotes biocontrol services, reduces insecticide use and increases rice yield in urban agriculture" for further consideration at eLife. Your revised article has been evaluated by Ian Baldwin (Senior editor), a Reviewing editor, and two reviewers. The Reviewing editor and the reviewer who have seen the previous manuscript agree that the new submission has been improved. It was difficult to find a replacement for one of the previous reviewers but we did get a review of an expert with a similar research area, i.e. with knowledge about the more zoological aspects of your study. This new reviewer has similar concerns to the previous zoological reviewer about lack of detail in the methods description. We hope that you can add all the requested detail in a revision. Please also check the further comments by the Reviewing Editor and the previous reviewer as outlined below. This resubmission of a previously rejected manuscript has been drastically improved by considering the reviewer comments and obtaining professional statistical help from two additional co-authors. Thus, the main message of the paper, that diverse margins around rice fields can reduce pests, increase predators, reduce insecticide use, marginally increase rice yield and increase economic benefit is now well supported by data and analysis. This is a very important contribution to the new topic of "ecological intensification" in the new field of "urban agriculture". I have no further major comments. It would be good if co-author Jacob Weiner could have a very careful look at the manuscript before the revised version is uploaded again. The revised version of this manuscript is clearly improved and, in my opinion, the authors satisfactorily addressed the previous concerns by all the reviewers. I think this is an interesting study on the benefits of diversification in urban agriculture and shows results of an impressive amount of data. The design of the observational study is not perfect, but the authors managed to alleviate my main concerns with this. I therefore have no further major comments. The topic of the paper is very important. The paper basically states that if plants (in fact, other crops) are planted around rice fields on the dams surrounding the fields, this reduces the need to use insecticides. I concur with the reviews on the first version of the manuscript – the details of the study, in particular the experimental design and the statistical analysis were unclear. I did not assess the statistical analysis in detail. 1) I find the title of the paper misleading. The manuscript does not analyse if increasing plant species richness increases biocontrol services etc., because the authors did not analyse diversity in the surroundings of the rice fields. Basically, they show that going away from the monoculture can be beneficial. Thus, the title should be "diversifying agriculture…" or "planting border crops enhances…"
2) Nowhere in the Results are a test statistic or the number of replicates are given. 3) Materials and methods: it is unclear how information on insecticide use was obtained. 4) Materials and methods: unfortunately, I find that still many details are unclear in the revision, see below. 5) Results: the effect on yield is only marginally significant and should not be overstated. Also, the authors provide no mechanism why yield was higher – do the insecticides not work? Subsection “Monitoring sites”: the entire section should be restructured, the design of the diversified fields is described twice (first and third paragraphs), the same is true for other information. Start with the region, then describe the farms, then how rice is grown and then the different treatments. Subsection “Monitoring sites”, first paragraph: please provide a drawing of a diversified field, and a photograph, how large is the area where other crops are grown. Subsection “Monitoring sites”, second paragraph: the pest control guidance by SATESC is not known to the reader – what are the insecticides used, what active ingredients etc.? Subsection “Monitoring sites”, last paragraph: what is a "Z" subplot? Again, use a drawing. Subsection “Common location experiments”, first paragraph: design unclear: what is the replicate – a block, i.e. three pairs of? Subsection “Common location experiments”, fourth paragraph etc. : Please provide more detail of the pest assessments: I assume the light kills insects attracted to the light? Were they collected in alcohol? Who identified the species? Why was the interval for the planthopper different if the same lamp in the same field is used? When you say each rice field, do you mean one in each of 9 plots per farm, or just one? Subsection “Monitoring and sampling methods”, last paragraph: did you only count predators on plants? Subsection “Common location experiments”, fourth paragraph: what is the correlation between number of pests and number of predators? I assume it is positive? Did you also count lacewing larvae? I also do not understand how the farmers decided when to spray – you state that there are economic thresholds, so there must be data on how often the threshold was reached? Were the pest data used for the threshold analysis the same that you used? Figure 1: I thought the 28 farms were mono-rice and only 6 diversified, not the other way round? Figure 2: were pest insects sampled all year round, or only from June onwards? This is not stated in the manuscript. In the first paragraph of the subsection “Monitoring and sampling methods” it states sampling was done May to September (April to September). Figure 5: 9-14 kg insecticide per hectare is a lot – what is this number referring to, the liquid that is brought to the field? Details on the insecticides should be given and the amount plotted in active ingredient rather than some other unit. We thank the editors for their comments and suggestions, which helped us greatly to improve the quality of the manuscript. We have carefully studied the reviews and revised our manuscript accordingly. My problems with the full submission remain, namely that the authors do not clearly enough explain the lack of randomization in the 15-year study (was it their choice not to randomize or was it because they met a "natural experiment" that had been started by others with lack of knowledge about statistical design) and use inappropriate, simple statistics. The first problem may be resolved by explaining in more detail who prepared the study and why it was not randomized. The second problem can be easily resolved by requesting the help of someone who knows how to properly analyze data from such experiments as the authors carried out. i nested within farm type i. Finally, ϵijk is the random noise term for each individual measurement. Note that while year is a continuous term in the random-effects component, year is treated as a categorical factor (yearFactorial) in the fixed-effect component of the model. We have applied a 3rd-degree polynomial transformation for the year variable as we have observed non-linear yearly trends among the various endpoints considered. This leads to a mixed-effect model with varying intercepts and varying coefficients for the polynomial year terms. In the random-effects component term μijkfrom the model above, the random intercept term and the polynomial year terms are used to model the farm-specific effects and the farm-specific yearly trends. Together with the individual noise term ϵijk, the random component μijk is the error term used for testing the farm type x year interaction effect and the farm type main effect in the mixed-effects model. To determine the significance of the farm type effect and the farm type x year interaction effect, we have employed a model comparison test, where the full model above was first compared against the model without the interaction terms. If the interaction effect was not significant, the interaction terms were removed and we then tested whether the farm type factor can be further removed from the model. For the test of significance, we have chosen the parametric bootstrap tests for mixed-effect model comparison. This test is preferable for small sample and/or unbalanced data, and was chosen here as the 15-year monitoring data was unbalanced (6 plant-diversified locations and 8 mono-rice locations). A brief description of the above model has been added to the revised article (subsection “Data analysis”, first paragraph). The use of the bootstrap test is also described in the revised manuscript (subsection “Data analysis”, third paragraph). where yijkl is a response variable, i∈ (mono-rice, plant-diversified) indicates the farm type, j∈ (first year, second year) specifies the year, k∈ (1, 2) indicates the farm identity, and l∈ (1, 2, 3) represents the replicates. μijkl is the random-effects component of the model, where b0,k, b1,ik, and, b2,jk are respectively the intercept, farm type effect, and year effect coefficients for farm identity k. Furthermore, ϵijkl is the noise term for the individual measurements. For the test of significance, we have chosen the parametric bootstrap tests for mixed-effect model comparison. This test is preferable for small sample and/or unbalanced data, and is chosen here due to the small sample size. The revised manuscript now contains a brief description of the model above. Thanks for the pertinent suggestions and useful questions. In the Discussion, we have hypothesized that plant-diversification farming can increase predator abundance. The increased abundance leads to increased predation and thus decreased pest abundance. The decreased pest abundance further leads to reduced insecticide usage and increased grain yield. A possible path-analytic diagram describing the above hypothesis is shown in Figure 11—figure supplement 1 where “+” indicates increase and “- “indicates decrease. Through the use of structural equation modeling techniques, the fitness of the above model can be assessed, and alternative models could also be compared. Currently, however, the predator abundance data were not well matched with the other variables’ measurements. Pest abundance, insecticide usage and yield measurements were collected for 15 years and across all 34 farms, while predator abundance measurements were collected for 9 years at 16 of the 34 farms (4-6 plant-diversified farms and 8-10 mono-rice farms were selected to monitor the predators from 2007 to 2015). This would induce difficulty analyzing the relationship between the predator abundance variable and the other variables inside the structural equation model. The common-location data is another possible data set for path analysis, but potentially have insufficient sample size for fitting structural equation models. While the causal relationships among the variables considered in this study can be further explored through the use of more advanced modeling techniques, but the current data may prohibit us from drawing sound conclusions from such analyses. The path diagram has been added to the revised Supplementary Information (Figure 11—figure supplement 1; Discussion, third paragraph). […] My main concerns are related to (1) the selection of the farms, (2) the set-up of the diversified farms, and (3) the insecticide use. We are grateful for the positive comments, and we have revised our paper in response to the concerns addressed. Two statisticians have been added to our team to perform the statistical model analysis, and we have paid attention to the above concerns proposed by the reviewers in the revised text. As stated above, we have rewritten the text to make all this as clear as possible (Introduction, seventh and last paragraphs). Again, we address thus fully in the revised text (Introduction, seventh and last paragraphs). The use of insecticides in 34 community farms is now clearly described in the text. In this study, pesticide application was not an independent variable, but it is still a very useful variable because pesticides were applied according to the same protocol. We appreciate the reviewer’s interest in our paper. We have changed the text in response to the comments. 1) When pesticide disturbance was excluded, higher plant species diversity in farming systems has hosted more insect predators, which is supported by a previous study (Wan NF, et al. Chinese Journal of Applied Entomology, 2012, 49: 1604–1609 (in Chinese)). Similar results excluding pesticide disturbance, were reported in our other papers: Wan NF, et al. Ecological Engineering, 2016, 90: 427–430; Wan NF, et al. Ecological Engineering, 2014, 64: 62–65; Wan NF, et al. Ecological Indicators, 2018, in press. 2) In this study, the farmers or workers applied pesticides according to pest abundance that reached the Economic Injury Level (EIL), as we explain in the revised manuscript (subsection “Monitoring sites”, second paragraph). Pesticide application is a response variable, not a true independent variable. Therefore it is extremely unlikely that pesticide application is driving the other results. A second major concern is the statistical approach used. First, the data are clearly time-series with nicely oscillating densities indicating lag-effects (Figure 2). In addition to lag-effects, the models should include more variables. For example, for explaining predator densities it would be important to incorporate the prey densities in the model. Thank you for a good question. As stated above, we have redone the analyses with the help of two statisticians. We agree that the farm type effect can be better elucidated by including more predictor variables into the model and by further accounting for possible lag-effects. Unfortunately, the available data may not be sufficient for such comprehensive analyses on the farm-type effect. For instance, the differences in location and time points where the predator abundances and other variables were measured preclude us from obtaining a data set with sufficiently-matched measurements suitable for analyzing the confounding effect of predator abundances on the other variables: pest abundances, insecticide usages, and grain yield were measured across 34 sites over 15 years, yet predator abundance were measured at 16 of the 34 sites across 9 years. Other questions along similar line of thoughts, such as the effect of insecticide usage on the other variables, were ruled out based on arguments mentioned in the response of the reviewer’s previous question. More complex associations among all the variables studied can be analyzed through alternative analytical approaches, and such analyses may be pursued in the future when suitable data can be obtained. Second, the model (no matter whether it is a time-series analysis or an ANOVA) needs to incorporate the fact that repeated measures were obtained from the same location. Also, to analyse long-term data with multiple t-tests (for each year one test) is not appropriate. Again, the new statistical analyses respond to these points. Third, the description of the statistical methods is confusing and incomplete. The concern of the reviewer is correct. This study did not expose a standardized number of prey to predators, but our former study has testified the main conclusion of higher predator in this study (Wan NF, et al. Chinese Journal of Applied Entomology, 2012, 49: 1604–1609). In this literature, when pesticide disturbance was excluded, higher plant species diversity in farming systems has hosted more insect predators. In response to the helpful comments and those of reviewer 1. The reference (Tscharntke et al., 2005) is very important and we cited it in lots of places. Also, to improve the quality of the literature cited, we have deleted and added some references. […] I have no further major comments. It would be good if co-author Jacob Weiner could have a very careful look at the manuscript before the revised version is uploaded again. Thanks for the encouragements. From the start, Jacob Weiner has been contributing to the manuscript and had a very close look at it before submission. […] I concur with the reviews on the first version of the manuscript – the details of the study, in particular the experimental design and the statistical analysis were unclear. I did not assess the statistical analysis in detail. We now provide additional information on the statistical analyses in the revision. Thanks for the useful suggestion. We changed the title to “Increasing plant diversity with border crops reduces insecticide use and increases crop yield in urban agriculture”. We now give this information. In the 15-year monitoring data, the farmers in the 34 community farms uploaded the pest information through the server into the Shanghai Pest Monitoring System which was accessible to the monitoring locations, 9 districts of Agricultural Technology Extension and Service Centers and SATESC (subsection “Monitoring sites”, fourth paragraph). In the common-location experiments, we kept a written record of the insecticide input for each plot, and this was used to obtain the information on insecticide use (subsection “Common-location experiments”, third paragraph). We have made the Materials and methods section much more detailed. In this revision, we have mentioned that “marginally higher grain yield”. Besides, we have provided the mechanism why yield was higher in the Discussion: “In all likelihood, the reduced pest abundance contributed to rice growth, development and reproduction, and thus increased rice yield”. “Thus, the most likely explanation is that the increase in the abundance of invertebrate predators spread from border and neighboring crop areas onto the rice fields, increasing predation on pest populations”. Thanks for the suggestion. We have restructured this section (subsection “Monitoring sites”). We have added a drawing of a diversified field, and a photograph (see Figure 13—figure supplement 1). The names and active ingredients of the insecticide used were listed in this revision (see Figure 1—source data 2). The drawing related to "Z" subplot has been presented in this revision (see Figure 12—figure supplement 1). For each site, the experiment was a randomized block design with three replicate blocks. Each block contained two plots – one for plant-diversified farming and the other for mono-rice farming (50-55 m × 30-35 m plot size in Xinchang, and 55-60 m × 35-40 m in Sanxing) (subsection “Common-location experiments”, first paragraph). Subsection “Common location experiments”, fourth paragraph etc. : Please provide more detail of the pest assessments: I assume the light kills insects attracted to the light? Were they collected in alcohol? Who identified the species? Insect trapping lamps were installed in the periphery of 9 paddy plots of each community farm to measure the abundance of the main herbivore pests. The lamps utilized light to attract the pests to fall into the cloth bags or cylindrical iron buckets of the lamp, and the workers in each farm identified the species and counted the attracted pests in the bags or buckets each day (subsection “Monitoring and sampling methods”, first paragraph). The sets of trapping insect herbivores are as shown in Author response image 1. Why was the interval for the planthopper different if the same lamp in the same field is used? The life histories and dates of occurrence on rice fields of pink rice borers and planthoppers are different. Thus, the monitoring intervals are different. From 2001 to 2015, we monitored the number of trapped pink rice borers and rice brown planthoppers from 10 April to 30 September and from 11 May to 30 September, respectively, as this was when they occurred in the rice fields (subsection “Monitoring and sampling methods”, first paragraph). When you say each rice field, do you mean one in each of 9 plots per farm, or just one? There were some errors in the previous submission. Insect trapping lamps were installed in the periphery of 9 paddy plots of each community farm to measure the abundance of the main herbivore pests (pink rice borer, rice brown planthopper, etc.) (subsection “Monitoring and sampling methods”, first paragraph). We only counted predators of the pests on the plants. We analyzed the correlation between number of pests and number of predators, and found that the relationship to be significantly positive (see Author response image 2). However, we think that this figure has no role in this study, so we did not present it in the revision. Additionally, we also counted lacewing larvae (subsection “Common-location experiments”, last paragraph). The correlation between number of insect pests and number of predators in rice field plots. Here insect pests included rice planthoppers, rice stem borers, and rice leaf rollers; predators were involved in ladybird beetles, lacewings and spiders. Economic Injury Levels of pink rice borers, rice brown planthoppers and rice leaf rollers are listed in Figure 2—source data 4. We have revised the caption of Figure 1. We have added the corresponding information in Figure 2. The insecticide per hectare that is brought to the field is the liquid or powder (amount of commercial insecticide). We think that commercial and active ingredient insecticide uses are both important indicators to analyze the ecological intensification. Thus, we provided another Figure 5C. We thank the agricultural technicians of the 34 surveyed community farms, the Shanghai Agricultural Technology Extension and Service Center and 9 districts of Agricultural Technology Extension and Service Center of Shanghai of China for collecting and providing data. We also thank Bernhard Schmid for helpful suggestions for the data analyses, and three anonymous reviewers for comments on the manuscript. This study was funded by grants from the Key Research Program of the Ministry of Science and Technology of China (2016YFD0200804), Shanghai Agriculture Commission of China (2017-1-2), Agriculture Research System of Shanghai, China (201703) and SAAS Program for Excellent Research Team (2018[B-01]). © 2018, Wan et al.